Cape Town, Mother City of Africa, and the Western Cape has a Mediterranean climate. This means it has hot summers and mild and rainy winters. Weather in Frankfurt am Main is some of the warmest in Germany. Offering mild summers and cooler winters, Frankfurt am Main weather is categorised as temperate-oceanic. The average annual temperature for the city is 10°C. During the summer (June to August) temperatures rarely peak above 25 °C, while in winter (December to February) lows can sometimes reach into the negatives. Frankfurt am Main or simply Frankfurt, the largest city in the German state of Hesse, enjoys a temperate oceanic climate that features cold winters and hot summers. Summer, June till August, remains warm enough to visit the stunning Frankfurt. Throughout this period the average high temperature stands at 25°C while the minimums hardly reach 14 °C. Like many other typical Hesse cities, June is the sunniest month of the year with more than 230 hours of sunshine and is a great time to enjoy the pride celebrations. Autumn comes in September and lasts till early November in Frankfurt. The season features more temperate weather with the average high 18°C in September, then 14°C in October. The Autumn Harvest Festivals are well worth visiting during this period. Temperature in winter falls below 4°C in Frankfurt. During this season the minimums around -2°C cause frequent frosts and icy roads in Frankfurt. 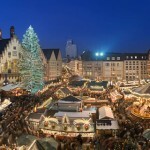 The city is transformed into a winterwonderland in November and December featuring the world famous Christmas markets, a truly magical time in the city. Spring is a great time to visit Frankfurt am Main. The season, from March till May, sees a great level of sunshine and more enjoyable weather. March sees more than 11°C of average high while the low stands at 8°C in May. Although sudden heavy shower may surprise you, in fact it makes the city more stunning. Frankfurt is a compact city with most of the gay bars located on 3 streets forming a “Bermuda Triangle”. The best hotels are all within walking distance of the centre of the city. Here are our editors top selections.